Stability. Most desks being promoted for use with treadmills are engineered to resist shaking too much when your swaying body makes contact with the desk. There are some desks, however, which have inherently poor lateral stability (e.g. the TrekDesk) so be sure to read through the reviews before plunking down cash. Fit. Obviously the desk will need to fit in the space you have available, but you’ll also want to note where the desks legs meet the floor and make sure the treadmill you’ve selected will fit properly between the legs. If you’re planning to put a chair to the left or right of your treadmill make sure the feet of your adjustable-height desk won’t be too constraining. When you anchor your body to the desktop as you walk and type oscillations are introduced into the desk frame, so be sure to tighten every bolt in the desk to the max without damaging the bolt threads. If you plan to use a fixed-height desk you may want to use a metal strap to attach the desk to a wall to add extra rigidity, or add a crossbar to strengthen the leg frame. If you use a monitor stand to hold up your display every little oscillation in the desk will be amplified by the monitor arm, especially if it is holding up a heavy monitor, so be sure to use only a rigid, high quality monitor stand like the Ergotron LX. Since the treadmill base is going to shake a bit when you walk on it you’ll want to make sure that the desk and treadmill base do not physically touch one another. If the vibration in the monitor becomes problematic, consider using an independent floor-standing mount or a wall mount for the monitor rather than having it mounted directly to the desk. Very few people are bothered by monitor vibrations at the lower end of the treadmill desk speed range. The human brain is really good at factoring out gyrations when walking, so a certain amount of vibration is not even going to be noticeable to the person who is walking (though people standing still who are also looking at your monitor will notice it a lot more). There are numerous desk-mounted monitor arms on the market. Most of these mount to the desk either with a C-clamp or with a through-hole (you’ll have to drill the hole out of your desktop to accommodate). Whatever arm you buy you’ll want to make sure it can support your monitor size and mounting standard (e.g. VESA), and have the reach you need. The most common problem with monitor arms on treadmill desks is that they do not reach high enough for the optimal ergonomic position when you are walking. We recommend the Ergotron LX Desk Mount Tall Pole LCD Arm, among others that can reach such top heights and are built really well. 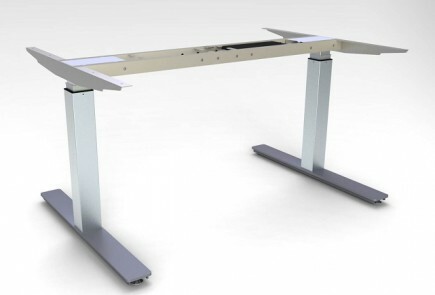 Flimsy monitor stands that can’t support even the lightest LCD monitors at any extension at all without flopping over a few degrees will annoy you until you replace them, so pay up for quality on this critical piece of your treadmill desk infrastructure. In general it is a good idea to use cable ties and other cable management methods to keep all cables neat and tidy. You don’t want unwieldy cables getting anywhere in between you and your treadmill while you’re walking. It’s also a good idea to install a small post somewhere along the front or side edge of your desk for hanging that telephone headset you’re likely going to want to use if you don’t already use one. A headset with a good noise cancelling microphone will make it easier for you to talk on the phone while walking, and it’ll help make sure the person on the other end of the phone doesn’t hear your treadmill in the background. Remember that Van de Graaff generator in science class? Well, your treadmill is a giant version of it. Any time you have a rubber belt rubbing across a laminated deck you’re going to build up enough static electricity to make a long-haired cat double in apparent size. There are no known ill effects to your physical health from static electricity to worry about but your computer equipment can be in serious jeopardy if you don’t take some precautionary measures. Skip this step and you may unwittingly fry your computer just by touching the keyboard with your fingertip. Needless to say if your treadmill has a three-pronged plug don’t put a converter on it and plug it into an ungrounded outlet. That said, not all treadmills even have a grounding prong on their power plugs. They probably didn’t anticipate users wanting to work on computers while walking on their treadmills, so it’s not all that shocking (excuse the pun). Some floor surfaces, like carpet, are going to be more problematic than others-concrete, stone or wood. A great solution regardless of floor type is to install an anti-static rubber mat under your treadmill. Such a mat will also protect your floor from scratches and dents from the treadmill’s feet. You may need to trim it a little to match the footprint of your treadmill and not to interfere with the legs of your desk. Another very easy way to break the circuit between your static-conducting body and your computer is to use a Bluetooth keyboard and mouse/trackball. At the very least if your computer is a laptop model it would be wise to use an external keyboard and avoid typing directly on the computer while standing on the treadmill. Certain models of laptops, such as the HP ProBook, have power switches that are touch-sensitive. These are notorious for shutting down the moment you touch the keyboard when you’re walking on the treadmill. This problem is easily resolved by using a Bluetooth keyboard and mouse.